If you ride a bicycle, you are doing your part towards living a healthy lifestyle and improving the environment. But riding a bicycle on city streets can be hazardous even though cities and small towns are encouraging more people to ride bicycles by constructing bike lanes and trails. In Northampton, the police department recently received a grant from the Executive Office of Public Safety and Highway Safety Division to pay for overtime traffic enforcement. The focus of the grant is to improve safety in the streets, which includes protecting pedestrians and bicyclists. 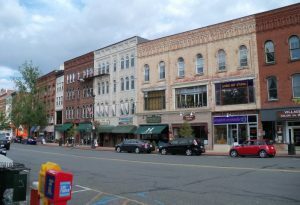 Northampton is a liberal enclave within a liberal state. A website, Epodunk, lists Northampton as the most politically liberal, medium-sized community in the nation. Numerous alternative health centers are located here as do a wide variety of restaurants. It is also a preferred place to live among the LGBT community and has a pulsating cultural center for everyone to enjoy. And, whether there is a connection or not, bicycles are a popular mode of transportation and recreation, which means that enforcing the traffic laws is essential. As motorists, we have all heard the advice to drive defensively, which means to anticipate that other drivers are not paying attention, are taking risks, or violating the traffic laws. The same advice applies to bicyclists. As a rider, you may be invisible to motorists or considered of little consequence to them. Many motorists do not wish to share the roadways with bicyclists and drive too close to them, cut them off, or enter clearly marked bike lanes with little regard for the bicyclists who are occupying them. With increased ridership across the country comes an increase in accidents. 6,000 pedestrians and cyclists across the nation were killed in 2016. In Massachusetts, pedestrians account for 20% of all fatal traffic accidents as opposed to the national rate of 16%. When riding, you must assume that motorists do not see you. When entering an intersection, try to meet the driver’s eyes or observe that they do see you. This is true when making turns as well. One law that many bicyclists disregard is that when riding on the roadways, you are required to obey the traffic laws. This means you cannot enter an intersection on a red light or ignore a stop sign. Unless otherwise posted, you cannot ride a bike on a sidewalk. As for crosswalks, if you ride your bike across one, then you could be considered a motor vehicle and be cited or have fault imposed on you to some degree if a motorist strikes you. There is a push in the legislature, however, to include cyclists as pedestrians when it comes to riding in crosswalks. Other measures that could soon become law include imposing a minimum distance of 3-feet between a cyclist and a motorist. There are 27 states that have some form of a safe passing law already. Many experts have recommended the 3-foot distance to minimize the risk of sideswiping. As for cars parking in bike lanes, there is currently a $50 fine for double-parking in such lanes or even to sit in a car that is impeding cyclists in a bike lane. So, be aware that as a cyclist you can be cited for speeding, making an unsafe lane change, failing to signal a turn, or running a red light or stop sign. You can also be arrested and charged with DUI. And if you are 16 and under, you are required to wear a helmet. As an adult, not wearing one substantially increases your risk of sustaining a head injury. If you were injured in a bicycle accident in Northampton, retain a Northampton lawyer to represent you. Being familiar with the city streets, bike trails and lanes, insurance adjusters, the claims process, and negligence and insurance law is essential in many cases in obtaining the compensation your case deserves. Liability in a bicycle vs. motorist claim can be difficult to establish if you are the injured cyclist. In many cases, the motorist’s auto insurer will claim you were at fault or at least comparatively negligent for violating a traffic law or not riding safely. In many of these cases, you may need independent witnesses who can assert that you were obeying the traffic laws and that you did not run a red light or stop sign or took the proper precautions. If the accident was at an intersection, there may be cameras that captured the accident. Following an accident, the defendant motorist may have said that he or she did not see you or the sun was in their eyes, which is an admission of fault. If you were in bike lane when struck, then it is more likely than not that the motorist will be considered wholly at fault. In any case, retain an experienced Northampton lawyer from the firm of Burns and Jain as soon as possible, If you wait, you risk losing valuable evidence or you could make an inadvertent comment that could jeopardize your receiving fair compensation for your injuries. If injured, you can seek compensation from the responsible driver’s auto liability policy. If the driver was uninsured, you can use the uninsured provision of your own policy, or that of someone in your household such as your parent or spouse, to seek compensation. Uninsured coverage in Massachusetts is optional, however, so you should have such coverage. It is highly recommended that you have at least $100,000 in such coverage since injuries in a bike accident can be traumatic. Your damages in an injury accident depend on the seriousness of your injury, the culpability of the defendant, your medical expenses, and how your injuries have affected your life, among other factors. Spousal claim for loss of consortium. Few injury cases are so clear cut that an insurance company will promptly and reasonably compensate you without substantial evidence supporting your claim of liability by their insured and proof of your damages. As highly experienced and aggressive Northampton lawyers, we will do all we can to ensure you receive fair compensation. Call us today for a free analysis of your injury claim at (617) 227-7423.